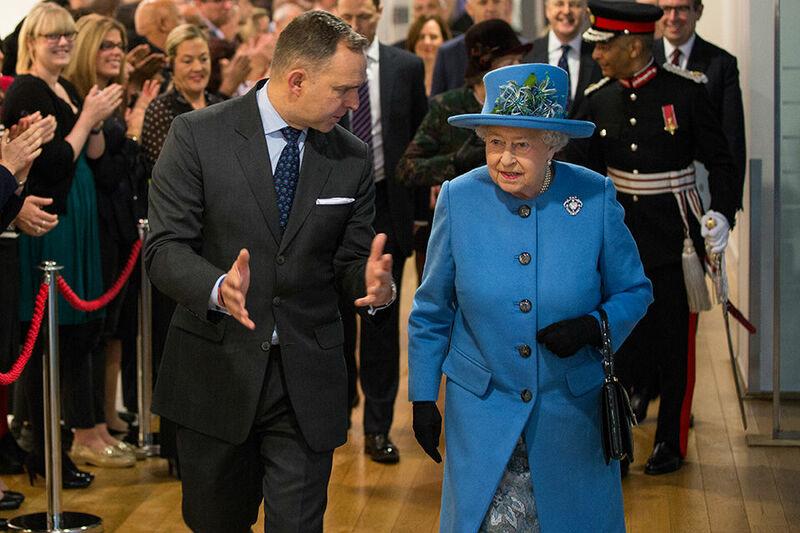 To mark the tenth anniversary of the Civil Service Awards, The Queen visited Home Office and DCLG staff to honour the work of civil servants. Here is the speech the she made at Marsham Street. "To mark the tenth anniversary of the Civil Service Awards, I have come here today to learn more about the important work you all do to support the activity of government in its many different forms. I know that being a member of the Civil Service, and indeed being involved in public service of any sort, is not always an easy task. Even the best public servants cannot hope to be popular with everyone all the time; and - as in every walk of life - there is often room for improvement and finding fresh ways of doing things. But occasionally it is right that we pause to recognise the vital work being done every day throughout the United Kingdom in the name of public service. From policy makers in Whitehall to public-facing staff across the country, we trust public servants to show integrity, stamina, and selfless duty, as well as essential values such as being fair, keeping one’s word, speaking the truth - even when that truth is unwelcome - and judging every case on its merits, often in trying or pressurised circumstances. The Queen addresses civil servants at the Home Office. These unwritten but deep-rooted values, nurtured over the 160 years since the modern Civil Service was founded, are the essence of the British spirit of public service, which is recognised throughout the world, and it is important that they continue to be celebrated and encouraged. For instance, a short distance from here, the Westminster Abbey Institute works with public service institutions near and around Parliament Square to deepen thinking about values in public life. And this evening I will meet the finalists of this year’s Civil Service Awards, whose contributions are in areas as diverse as forestry, early years learning, and tackling Ebola. A life of public service is an honourable calling: you have the opportunity to shape people’s lives, inspire others, and uphold the very highest standards. And so, to all of you here today, and to everyone whose role is to serve the needs of others, I want to say thank you for all that you do." I am proud to be a civil servant and serve my country. However we are let down by poor management and leaders who fail to grasp the concept that the staff are people and each have their own skills and talents that need recognising. Putting pressure on them all to be better than their colleagues by the outdated Performance Management policy totally demoralises the staff and reduces their engagement with the management. Unachievable targets are then followed by the 'must improve' marking are not conduicive to a pleasant working environment and it is no wonder a lot of staff have had enough and leaving. The annual staff survey surely will highlight this point. This is a suggestion. As this is a life time experience, I woulds suggest that an official video should be made available to any member of staff would like to own a copy of the Queen's visit. We can pay of it if necessary. we have added the video of the visit to the post. It would have been nice to view the video but it's been blocked by DWP's internet filtering software! At the site I'm located at, the video appears to be blocked. Queen Elizabeth II is a remarkable monarch. It's great to be appreciated by a member of the establishment. She obviously recognises the value of our jobs and the important role they play in maintaining the society we have. I'm so glad we don't have to suffer the inconsistency and impermanance of a presidency. She is wonderful example of how good leadership, tempered with compassion, makes for a Great Country. You are wrong on all points. Get your head out of the sand. Her Majesty, has been a very good ambassador for the UK. At least there is one constant good in public life. All others can only hope for this kind of respect. Her Majesty is my inspiration. Thank you for visiting and recognising the hardwork put in to keep the country safe. It is really good to hear that we are still respected at the highest level and i am sure that the Queen genuinely appreciates the work that public sector workers do.Maybe politicians and governments should read her spreech and start treating us with the same respect. I so agree with Alan Colquhoun - HM has been a constant thread in the conversation which is the UK of Great Britain and Northern Ireland. Long may she reign. The speech was not written by Francis Maude. Please give us access to video's that are profiled on our intranet pages. I would really like to see it. we've added the video to the blog post. It's on Youtube so you should be able to see it - although that does depend on your department's IT. Someone I know attended a previous CS Awards and spoke to her Majesty and Prince Phillip. He said they were both very clued up about the Civil Service including the cuts! Great to see her meeting more of us. Ironically, it's blocked by the Home Office IT policy! A wonderful speach which can inspire us all to continue the great work that we do. I for one am proud to be a Civil Servant and take pride in trying to help people where ever I can. Seeing as the Queen values our work & Michael Fallon has thanked staff at DE&S/MoD on previous visits, is it not time to give us a proper thank you in the form of a 3% pay rise?